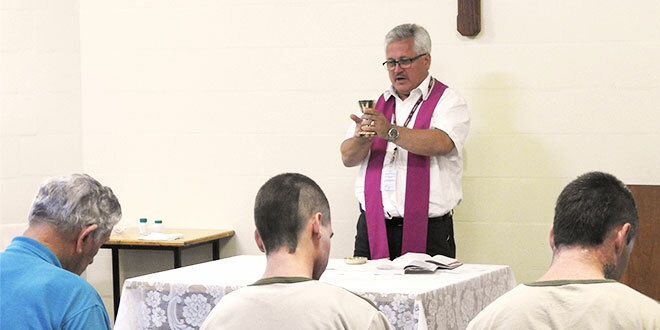 Mercy call: Fr Tony Girvan celebrates Mass in the prison chapel at Maryborough Correctional Centre. 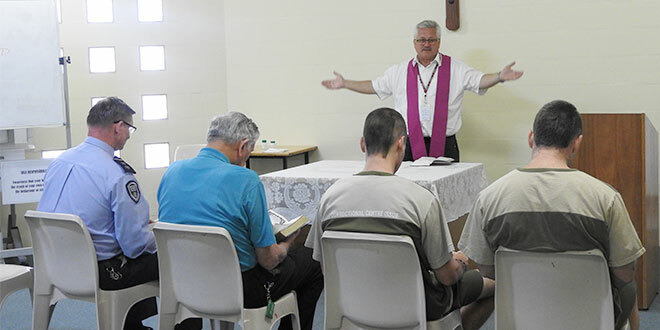 IN a simple prison chapel, chaplain Fr Tony Girvan celebrates Mass with inmates at Maryborough Correctional Centre for the final time during the Year of Mercy, delivering a missionary message “of revealing God’s love to all people”. “They are loved and we are called to preach the Gospel through the way we love each other,” Fr Girvan said. In the year of Mercy, Pope Francis has emphasised Jesus Christ was close to those in prison, and that no matter what the sin, God’s love was still unconditional. “No cell is so isolated that it can keep the Lord out,” Pope Francis said. The Holy Year of Mercy concludes today (November 20) with the closing of the Holy Door of St Peter’s Basilica. Everyone, the Pope said, was in need of God’s forgiveness and of “brothers and sisters” who helped them to receive the love reflected in Jesus’ death on the cross. “Let us not impede each other. We do not exclude anyone. Rather, in humility and simplicity, let us be instruments of the inclusive mercy of the Father,” Pope Francis said. Fr Girvan celebrates Mass once a month for inmates at the Maryborough Correctional Centre – his services are stretched across Brisbane archdiocese, but he is supported by Centacare’s team of chaplains delivering pastoral care on a daily, rostered basis. 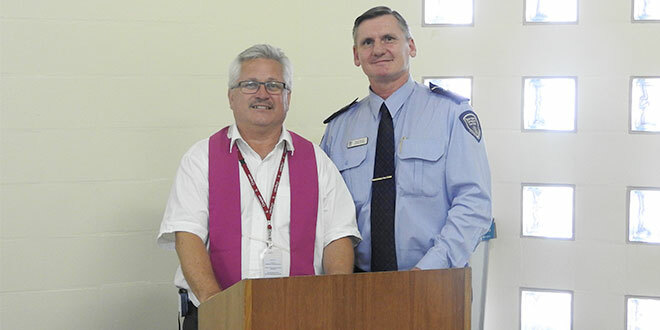 In the Maryborough Correctional Centre the Church ministry also receives a helping hand from the prison’s general manager Darryll Fleming, a Catholic and a 26-year veteran with Queensland Correctional Services, who often attends Mass alongside inmates. “It puts me at the same level as the prisoners. It is important for me that I don’t separate myself from the prisoner,” Mr Fleming, a parishioner from Darra-Jindalee in Brisbane, said. “Having a general manager attend Mass with prisoners, receiving Communion, is actually a very inclusive model. It actually breaks down barriers. Mr Fleming said he saw his role was to provide opportunities for prisoners to progress through their life, and that included opportunities to make good decisions. He supports the pastoral care, provided by Centacare and other agencies, with chaplains visiting the prison. “In conversation with prisoners I tell them all ‘you have a pathway, and I will give you a pathway – you can stay on the path, hop off the path, invite others onto the path, and if you are on the path and you are not sure which way it goes at a junction, well, I will get some people in to help direct you’,” Mr Fleming said. Centacare has a team of more than 20 chaplains which regularly attends 11 prisons across the archdiocese. In Maryborough, Mr Fleming said he was trying to introduce greater spiritual access for his inmates. During his long years of prisons service he said he had never seen a missal in a Queensland jail. “So I went and bought a number of missals to put in our chapel and in our library for prisoners to borrow, so that those who couldn’t attend Mass could at least follow Mass in the same way as the community,” he said. Offering hope: Centacare chaplain Vince Dollison, Fr Tony Girvan and Maryborough Correction Centre general manager Darryll Fleming at Maryborough Correctional Centre.